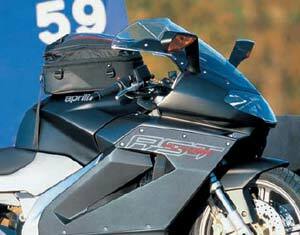 The Aprilia RST1000 Futura is fitted with a plastic fuel tank, which means magnetic tank bags are no use. However, there are plenty of alternatives here. There have been bad reports about the official Aprilia tank bag. It doesn’t fit well on the Futura, and isn’t very good quality. If you’re using a strap-on type of tank bag, you need to work out a way to protect the paint from the straps as it marks very easily. I found this out to my cost when I fitted an Oxford Humpback tank bag to my Futura. The bag didn’t last long either. There are also bags that clip to a ring you fit to the edge of the fuel filler cap. There’s also the Bagster system, which is popular especially in Europe and the UK. 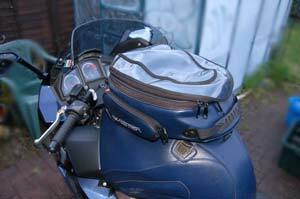 Bagster make a colour-coded tank cover for the Futura (about £90)to which you can then fit any bag from their range. I chose an Alpha bag with an expanded capacity of 40-odd litres (enough for a full face helmet) and a rain cover that works well. I’m collecting reviews of different tank bags for the product review section. If you have experience of a tank bag for the Futura and want to write a review then get in touch. You can also make short comments below.